Ever since he graduated with a bachelor’s degree in computer science from Bengaluru’s Global Academy of Technology in 2012, Sidharth Bhansali has had a successful career in blogging about consumer electronic products. The advertising revenue that he generates from his multiple blog sites is more than sufficient for him to afford a dedicated work desk for ₹17,500 a month at WeWork Galaxy on Residency Road, Bengaluru, the shared office space of New York-headquartered startup WeWork. “I waited for three years for WeWork to open,” says the 27-year-old, who had been working from home before moving in to the WeWork facility. He was among the first freelance professionals to register at WeWork Galaxy when it opened in July 2017. Like Bhansali, a growing workforce of independent professionals and short-term contract workers, both millennials and otherwise, is driving the gig economy from shared workspaces. “A lot of people from the corporate world, who are above the age of 40 and find their work becoming stagnant, are looking at freelancing as well,” says Rishi Das, co-founder of CareerNet Consulting, a talent acquisition company. Consider 50-year-old Ajay Ushakanth. After having successfully run a baby retail store in Bengaluru, he shut shop in 2014 and started teaching the Vedas. Ushakanth worked out of a friend’s office for two years before moving in to WeWork Galaxy, where he pays ₹20,000 a month for a dedicated workspace. A host of independent entrepreneurs, including Bhansali, across WeWork’s facilities in Bengaluru have taken up learning the Vedas from Ushakanth. 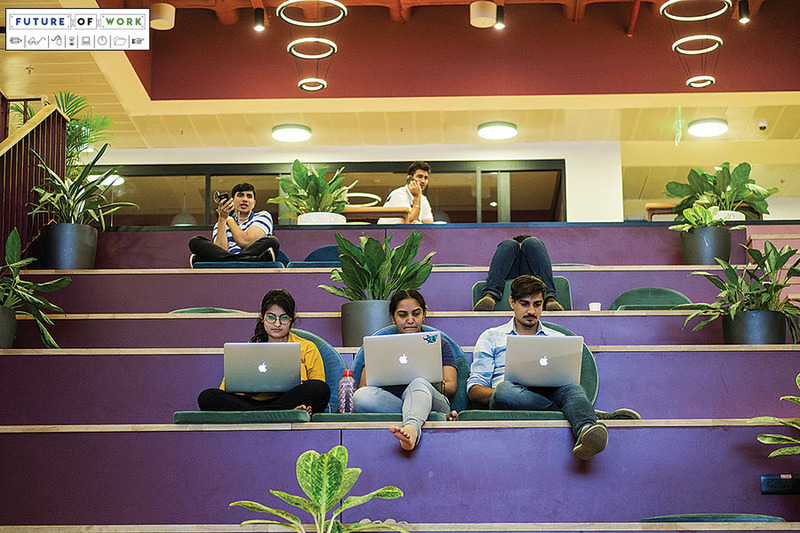 “Freelancers are the beneficiaries of co-working spaces because they find their customers and clients within these spaces,” says Sidharth Menda, CEO of Bengaluru-based CoWrks, which has 1.1 million square feet of operational co-working spaces across Bengaluru, Chennai, New Delhi and Mumbai. 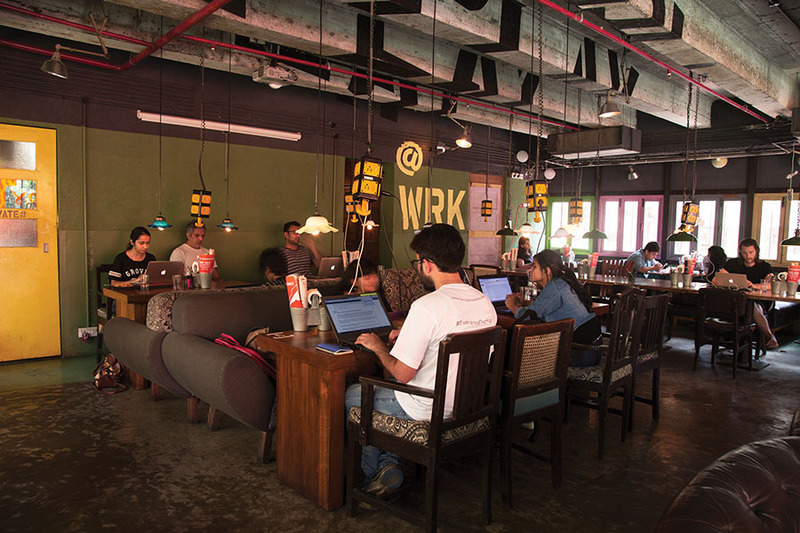 Menda says about 50 percent of his members are large enterprises, while SMEs and startups account for 30 percent and the remaining 20 percent is freelancers—a split that’s the same across most co-working facilities in India. The share of freelancers is higher in the US, where the gig workforce, comprising independent contractors, temporary and contract staffers and on-call workers, accounted for about 10 percent of the overall workforce in 2017, according to data released by the US Department of Labor. One reason for the higher share of a gig workforce in the US is “if you are a freelancer, you get more benefits and the taxation is lower,” says Das. Even though this is not yet the case in India, there is a growing demand for freelancers and short-term contract workers. Last year, Das held a closed-door roundtable meet with the HR heads of Infosys, Wipro, GE, Mindtree and the like. “One of them clearly said a good part of their workforce is freelancers. Clearly, companies, specifically large enterprises, are looking at this kind of a workforce,” says Das, who is also the chairman and co-founder of the co-working space provider IndiQube. Companies like Aricent (a design and engineering company), Incedo (IT services), Microsoft, ArcelorMittal and OLX have taken up co-working space at Smartworks for their short-term contract employees. “Aricent has taken up 400 seats with us at our Bengaluru facility,” says Neetish Sarda, founder of Smartworks, a New Delhi-based co-working firm. “Their space is fixed, but their workforce keeps changing every six to seven months,” he adds. The demand for freelance work, says Das, is for specialised talent in the field of robotics, artificial intelligence, UI and UX design, and digital marketing. There is also a growing freelance workforce of architects, lawyers and chartered accountants. “If we look at startups, the share of work being done by freelancers is very high because most of them want to keep their teams lean and want to be agile. Some even employ part-time CFOs,” says Das. A lot of travel companies in India, he adds, are hiring a temporary workforce, largely consisting women who work out of their homes during the peak travel months, which mirrors what happens in the US during the Christmas sale season. While there isn’t any official data on the size of the gig economy in India, signs of it becoming mainstream among the blue- and white-collar workforce are visible. At the blue-collar level, you have delivery executives of ecommerce-driven entities like Flipkart, Amazon India, Zomato and Swiggy, as well as the driver-partners of ride-sharing companies Uber and Ola. “People who are in finance, human resources and legal functions are realising that growth in the corporate world is becoming stagnant. And we are seeing these people taking up freelancing work,” says Das. The mainstreaming over the last few years could also be attributed to the change in people’s mindsets as, in India, jobs are coupled with social status. “As a result, people have not been very excited about freelancing,” says Das. But the whole startup culture has changed people’s attitude towards work— from taking up a safe job to betting one’s career on a fledgling venture that could go bust in under a year. In 2015, the doctor-turned-entrepreneur Ritesh Malik set up a co-working facility, Innov8, in Connaught Place, New Delhi. It was a 150-seater space for startups and freelancers. “We soon realised that if you want to create a very profitable business [out of co-working], you need to have predictable long-term revenue and that does not come from startups and freelancers,” says Malik. As Innov8 expanded to Mumbai, Bengaluru and Chandigarh, Malik pivoted his business model whereby 80 percent of the business would come from enterprise clients or those with “very predictable revenue” and 20 percent from startups and freelancers. However, Malik believes this number will increase to 35 percent five years down the line. While startups will definitely be the growth driver of the gig economy, the demand for white-collar workers, on a temporary and contract basis, by corporates is on the rise in India. “A lot of companies [especially IT and ITeS] are open to the idea of having temporary staff working for four hours at distributed centres [co-working facilities],” says Das. And, as the gig economy evolves in India, Das and other co-working space founders see scope for specialised spaces. Take the human resource industry as an example. Das is planning to step up hiring centres, which would be manned by freelancers, across the country that would be used by multiple companies. “It would be like how a passport office is run—you walk in with your CV and if you are selected you walk out with an offer letter,” says Das. Three of the top 10 IT companies in India, he adds, have asked him to set up 50 hiring centres across the country. Sarda of Smartworks is looking at dedicated co-working spaces for lawyers and accountants. “Instead of having a big games room and gym, which is at most of our centres, we will have a big library, more meeting rooms, and offer services like stenographers on-call,” he says. These would be smaller 10,000 to 12,000 square feet co-working spaces that would house around 100 people as opposed to a typical Smartworks co-working office, which is about 80,000 square feet in size and can seat about 900 people. “There are people trying to do specialised co-working spaces for blockchain and fintech. While there are significant benefits of doing so, what you lose out on is the breadth—the exposure to people from multiple industries [under one roof],” says Menda of CoWrks. It’s a thought that app-developer Goutham Iyyappan concurs with. “How often would you meet a person like Ushakanth or Bhansali?” asks Iyyappan, 28, who works out of WeWork Galaxy, in Bengaluru. It’s been a year since his company vClusive, part of California-based vMobo, moved in at WeWork. “I’m an app developer and so my work circle are all developers and testers. But when you come to a place like this [WeWork] there is so much diversity,” says Iyyappan, who along with Bhansali attends Ushakanth’s Veda classes. Delete forever: Will emails die a natural death?